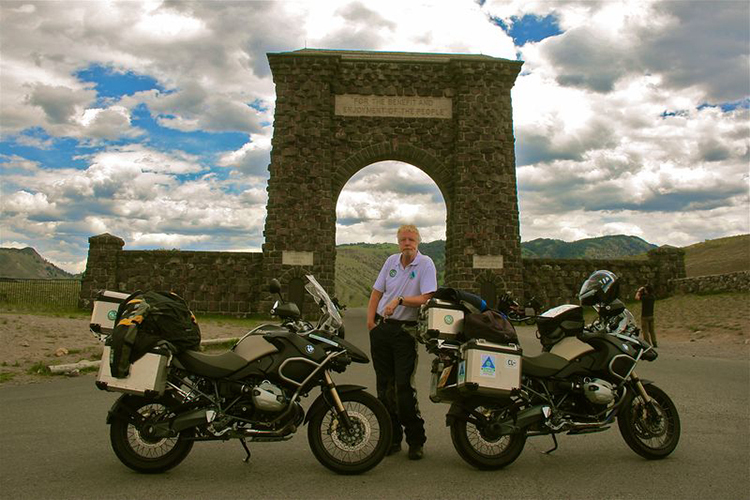 Geoff Hill’s latest update on – THE CS CLANCY CENTENARY RIDE – Strangely Content! As we crested a mountain to be met by all its cousins stretching all the way to the horizon, Dr G pulled into a lay-by. “Welcome to Montana. Fourth biggest state, size of Germany, only a million people, and you can see why they call it big sky country,” he said. This was home to one of Dr G’s three houses, as well as Denver and Arizona. Not to mention the one in Thailand where he wintered for six months with his wife, a Thai physiotherapist. “I did live for a couple of years in the Seventies in a converted 1958 school bus I used as a race base. My then wife and I decided to change our lives and move to California, so we sold everything, put two motorbikes in the bus and a car on the trailer hitch and set out for San Diego,” he said. Further down the road, a series of billboards heralded the forthcoming week-long Rock Creek Lodge Testicle Festival, presumably culminating in a series of gala balls. This, since you ask, is a celebration of the time of year when young bulls and rams are deprived of their family jewels, which are then fried and eaten as a delicacy known as prairie oysters. They are, by all accounts, delicious, but you’ll have to take Rock Creek Lodge’s word for it, since although I’ve eaten everything from grasshopper to guinea pig, a chap has to draw the line somewhere. In Butte, we spent the evening at a barbeque at the home of John and Linda Davis, friends of Dr G.
“Mmm, this elk is lovely. Where did you get it?” I said to their daughter Gina. Leaving Butte with no regrets, Clancy and Allen camped that night east of Whitehall, only to spend the entire sleepless night being tortured by the biggest and most voracious mosquitoes yet. 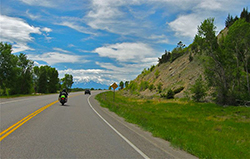 After a bleak breakfast of apricots and unripe bananas in the barren crossroads town of Warren Creek, they met a fellow biker who was on his way to Chicago. 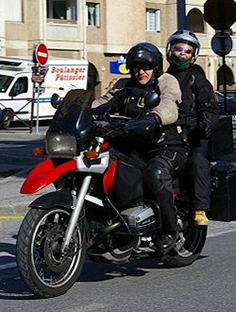 A keen reader of the Bicycling World and Motorcycling Review, he asked Clancy if he’d read about the bold youth riding around the world on a Henderson, then proceeded to regale Clancy with his own adventures until Bob spoiled the surprise by revealing the truth. After getting separated from Bob in the dark, Clancy finally spotted a light and was glad to find his companion waiting on the steps of the Corwin Hot Springs Hotel, where after 16 hours in the saddle they were glad of the eponymous springs around which the hotel had been built in 1909, boasting 72 rooms, a large swimming pool and hot showers fed from the springs. Barred from riding into Yellowstone National Park the next morning, Clancy and Allen joined a coach party tour, then set off on a road so bad that they were forced to ride on the railroad sleepers, at which point Clancy’s saddle broke, treating his nether regions to miles of painful bumping along so slowly that it was dark by the time they got back on the road. Remarkably, none of his travails had sapped Clancy’s boyish enthusiasm, for the next day he begged a ride on a locomotive, then almost regretted it when it sped into a tunnel and he almost suffocated on the sulphurous fumes while the fireman cheerily related how his predecessor had been asphyxiated in that very same tunnel the previous summer. Leaving Butte the next morning, we rode out of town and up the hill to the Continental Divide. West of here, all rivers flow to the Pacific, and east, to the Atlantic, and by the roadside was a small puddle left from the overnight rain trying to make up its mind. At Bozeman Pass, we stood right over the railway tunnel where Clancy had almost been asphyxiated, while beside us a wooden sign related the history of John Bozeman, the adventurous Georgian who led a wagon train through hostile Indian territory and across this pass in 1863. “Hostile is right,” said Dr G. “The Crow were so feared that when they stole horses and women from the Sioux, the Sioux would only come over in raiding parties of up to 15,000 to get them back. Then of course the Crow would steal the horses back. “Why not the women?” said Gary. “The women would come back by themselves because the Crow were such good lovers. Still are, of course,” he grinned. 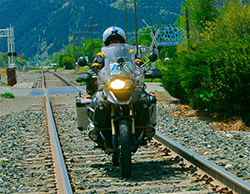 At Livingston, we found part of the railroad line that Clancy had ridden along because the road was so bad, and since there were no trains in sight, we had to follow suit and ride the tracks, then went in search of Corwin Hot Springs. 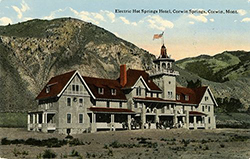 The sumptuous hotel they were so glad to find after 16 hours in the saddle that day was a magnificent Gothic creation with a red-tiled roof with the mountains on one side and the Yellowstone River on the other, according to contemporary photographs. 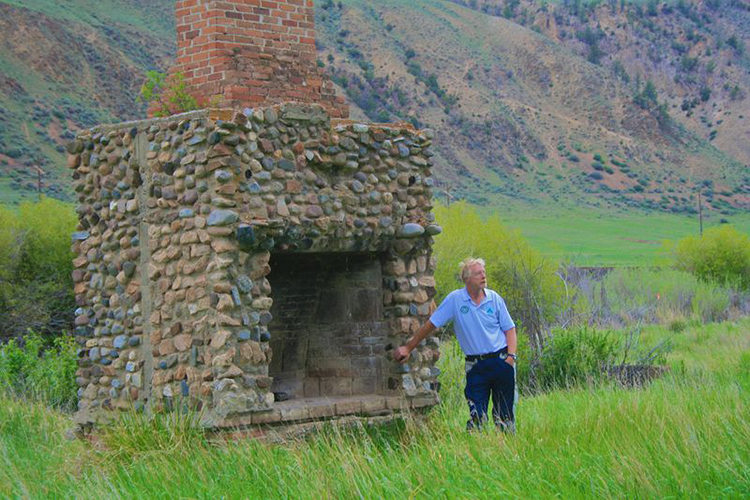 It was destroyed by a fire in 1916, and today, according to my research, all that remained of the original clubhouse was the great stone fireplace. We had given up searching for it and were riding away when Richard suddenly swerved off the road, down a rutted path and into a grassy meadow by the river. 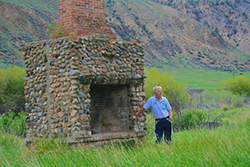 And there we found the great fireplace. As Richard and Gary wandered off to take some photos, I lay down in the warm grass at the spot where I imagined Clancy and Allen lounging in a leather club sofa and toasting their toes by a roaring fire. I closed my eyes, all the better to see the image of Clancy gazing into the firelight and looking back on an entire lifetime of hopes and dreams which had been condensed into his past few months, as it had for us. And in that moment I felt at one with him, and strangely content.